This is not a hopeful future. She learns far more about the world than she imagined – the existence of half-demons and werewolves for a start. 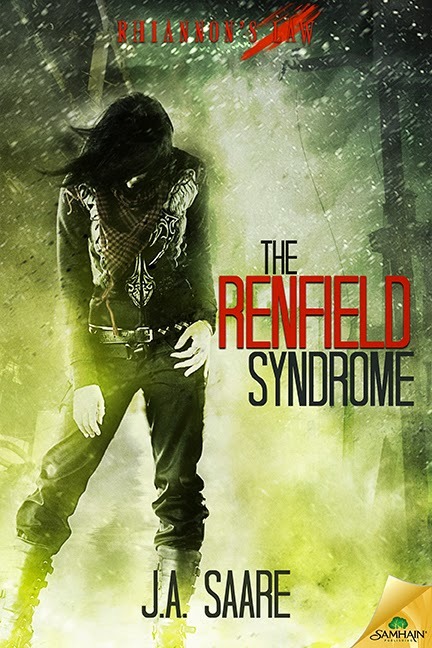 But she also learns about the ominous future awaiting them – the Renfield syndrome, wiping out a vast amount of humanity and leaving many of the rest enslaved to vampires – or languising under the werewolves’ dubious… protection. Rhiannon has to find her place in this war torn, devastated world – and desperately try to find a way home. I wasn’t a big fan of the first book for several reasons. But this book was a massive step up. On top of that, Rhiannon was the driver of the plot for her own reasons, following her own planning and according to her own, personal motivations. She refuses to be manipulated, adamantly refuses any attempt to protect or shelter her (especially when that protection means imprisonment” and equally refuses to be pulled into anyone else’s agenda – even that of loved ones. She knows what needs to be done, she knows what she needs – with the looming deadline of the demon contract in front of her as well as the alien world she finds herself placed in – and refuses to be pulled into comfortable, safe existences even with people she cares about or even when it would be easier to do so. As an extra bonus, Rhiannon actually went about achieving her aims with something resembling sense, planning and coherent thinking which was nice to see (ok, her success was based on huge chunks of luck and a magical-shiny that is ridiculously overpowered and renders far too many conflicts sadly anticlimactic, but she used her over-powered deus ex with decent common sense). Personally, I also really appreciate Rhiannon’s refusal to forgive. When she is abused or wronged Rhiannon doesn’t just let it go – I like that because we have culturally absorbed an idea that forgiveness is some kind of duty; that somehow if we do not forgive people who have harmed us then we are failing as a person in some way. I appreciate the subversion of that – Rhiannon does not always accept an apology, in fact, if she has been hurt she won’t even give the person a chance to apologise: she will create, demand her own space away from them and no matter how much they want to reconcile, she will not be open to that until she is ready. The plot itself is engaging, albeit a rather jarring departure from the first book, in the way it revealed more about the world, the conflicts and the future that was looming before them all. The plot was not only good, but it set this series up in a way the first book didn’t – we have direction, we have focus, we have a character who has finally proven themselves as being other than generic (and other than annoying). After an initial stumble, this book did everything the first book should have – I now have a world, a cast of characters and a meta-plot to enjoy and be engaged by – and I am both. Take Rhiannon’s relationship with Disco and Paine. Both of them are integral to this book, they’re central to a lot of Rhiannon’s motivations and conflicts and they were terribly set up in the last book and made it a real struggle for me to connect with what she was doing/feeling/thinking in this one. There was also an issue of incomplete or glossed over world building (especially in regards to world building) in the first book which left me a little lost, and characters introduced with a sense that they were big and important last book, but actually had relatively little involvement and, again, left me a little floundering. Then there’s Rhiannon’s character reactions – she was so unreasonably raging and awkward and snarky in the last book that her much more REASONABLE snark and anger in this book harder to run with. This book worked a lot better when I extrapolated a lot more time had passed and a lot more character interaction than we had actually seen (or than there was space in the narrative for) and generally make a lot of assumptions or outright mental edits of the first book to make this one flow. Sadly, another element that hasn’t improved is depiction of marginalised people. I think there are less POC in this book – in fact the only ones I remember aren’t even overtly labelled as POC, you have to remember their description from the previous book to realise. There are no LGBT people. And Rhiannon’s relationship with most other women is… problematic. In the present she is good friends with Deana and there seem to be some decent female vampires – but that makes up maybe 3 pages?) for the rest of the book she’s fairly friendly with one woman who, again, only appears briefly (and is doomed to be evil) and protective of another who she rescues (and the rescued is very very very fragile). Contrast that with several female werewolves who loathe Rhiannon, are jealous of her – and are not only insulted in a pretty sexist manner, but also in a highly transphobic manner since they don’t meet Rhiannon’s standards of femininity. Then there’s an evil female villain who actively tries to have another woman raped. Even her description of the strippers from her job cast them as “catty” and competitive. The people who spend the most time with Rhiannon, who support her, who help her, who are her fellow drivers of the plot seem to be primarily men.